Join our growing list of subscribers. Sign up for email alerts! Get inside information, real estate news and helpful tips. Your email address is kept safe and won't ever be shared with anyone else. Chagrin Falls is a village in the northeastern quarter of Ohio, located approximately 40 minutes east of Cleveland. This community has a lot to offer, including a low crime rate, great schools, a rich history, and a friendly, small town community feeling. 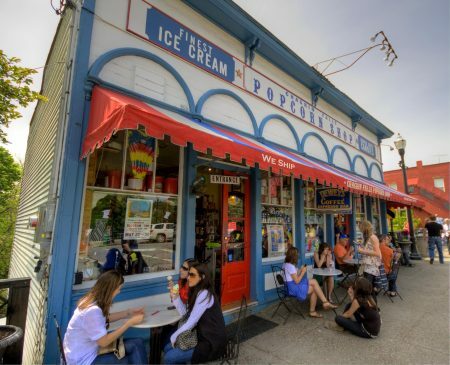 Read on to learn more about why Chagrin Falls is so great! #1. Low Crime Rates: Chagrin Falls has a crime rate that is 64% lower than the Ohio average, making it a safe place for the whole family to live. #2. High Graduation Rate: The high school graduation rate in Chagrin Falls is 15% higher than the high school graduation rate in the state of Ohio as a whole. This community even includes a National Blue Ribbon School. The schools here are known for their relatively low student to teacher ratio, high test scores, and excellent parent teacher communication, all of which contribute to the continued success of their students. #3. Village Lifestyle: Chagrin Falls is proud of its friendly residents and community atmosphere. This 4,000-person town is close knit, with plenty of community activities throughout the year. #4. Historic Buildings: Chagrin Falls was established in the mid 1800s, with its official incorporation occurring in 1844. Most of its founding members were part of a religious group, resulting in the construction of several churches early on in the village’s history. There are several present day churches in Chagrin Falls that date back to the period of its founding, including the Methodist Church on Franklin Street. In addition to the churches, the village was home to a team of craftsmen who specialized in building intricate brick residences. Many of the Chagrin Falls homes that were first built in the mid 1800s have been restored and are now preserved as a part of the National Register of Historic Places. #5. Great Shopping: Chagrin Falls has an eclectic collection of shops and boutiques. The storefronts on Main Street and Franklin Street are home to antique stores, art galleries, a bookstore, a jewelry shop, and more. This area is known for its artistic flair, and that is readily apparent when you look at the high number of art galleries in the area. #6. Chagrin Valley Little Theater: Another artsy spot in Chagrin Falls is the Chagrin Valley Little Theater. Here, residents can enjoy community theater productions and then stroll down the street to the Valley Art Center to enjoy art exhibits that encompass a range of styles and mediums, including 2d and 3d works. #7. Outstanding Restaurants: The restaurants in Chagrin Falls range from fun and affordable to classy and elegant. There are several upbeat diners and pubs where you can meet your friends and bring the whole family. Another popular spot is Rick’s Cafe, which has live music and sells wine by the glass, making it the perfect place for any celebration. Then there’sthe very original Umami, which serves Asian-inspired cuisine. Ranked one of the “100 Best Restaurants in America” in 2015 by OpenTable diners,it’s been named one of the “25 Sexiest Restaurants in Cleveland” by The Plain Dealer. Also not to be missed is Grove Hill, which serves inventive New American cuisine and has a warm, welcoming vibe. As you can see, Chagrin Falls has a lot to offer its residents. If you are still interested in learning more about this close knit village, be sure to visit our community page. You’ll find a wealth of details regarding the area and its real estate. Should you have any questions, do not hesitate to reach out!